You chase happiness, yet you sense the gate is closing and the sun is setting on your deepest hopes and dreams. Jesus announced, “I have come that they may have life, and have it to the full.” But for many, Jesus’s promise of life remains hidden from view. In Chasing Moments, cattleman and pastor Ed Malone reveals Jesus’ message of hope to the disillusioned. Using stories from the farm, he shines light on the often hidden nuances of Jesus’ parables. Now’s the time to put into action a vibrant faith—not just a way to believe, but rather, a satisfying way to live. According to Jesus, there is a small gate and a narrow way that leads to life, and only a few truly find it. 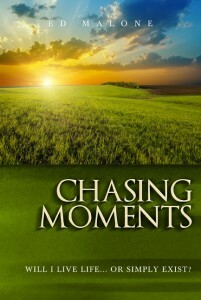 Chasing Moments helps readers break through the confusion of man-made religious forms of Christianity, discover what others miss, experience supernatural change, be shaped spiritually for the next life, and find that which is worth everything! Sign up for newsletter and get first chapter immediately by email. Click "Order Now" at right to send email requesting a copy of the book. For this reason a man will leave his father and mother and be united to his wife and the two will become one flesh (Eph. 5:31). I in them and You in me . . . (John 17:23). The mystery, Christ in you . . . (Col. 1:27). Sadly, many Christians never even come close to either of these desires that God has for us. Without oneness with God, oneness in marriage remains an illusive quest. Learning to be spiritually empowered in the pursuit of both of these goals is the key. 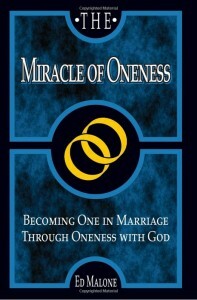 The Miracle of Oneness seeks to be your guide as you allow God to fulfill His great desire for you and your marriage.